Probably Nuremberg, Germany, Table Clock with Orpheus Frieze, 1560-80 with later movement. Gilt brass, brass, steel, blued steel, silver and blue enamel, 3 1/2 h x 9 3/4 inch diameter. Milwaukee Art Museum, Gift of Richard and Erna Flagg, M1991.84. Photo by John Nienhuis. When you visit the European galleries of the Milwaukee Art Museum, you may have noticed that in the “Renaissance Treasury” gallery (gallery #2) there are a lot of clocks! These aren’t the wristwatches and battery-powered kitchen clocks that most of us have in our homes and offices. With their highly decorative cases, these special clocks show highly-skilled and artful metalwork that celebrated a new way of time-keeping during the Renaissance. Until the 14th century, time-keeping was not systematic at all. The only way to tell time was to look at the sun, or to use a sun-dial, but that was tricky because the length of the day changed so much over the course of a year. Another option was to use a water clock, which used flowing water to move gears, but they were large and cumbersome—and not always very accurate. During the 14th century, large weight-driven clocks were built in towers. You’ll see that many towns in Europe have medieval clock towers so that it was available for all of the residents to use. During the 15th century, clock mechanism began using springs and gears. Around 1500, just in time for the Renaissance, this new technology led to a proliferation of table clocks. These new machines not only could divide the day systematically into hours and minutes, but they could also track the zodiac, phases of the moon, and seasons. Highly esteemed craftsmen would make these for the wealthy patrons who could both afford the valuable mechanism and be able to understand what all of these symbols meant. Probably Nuremberg, Germany, Table Clock with Orpheus Frieze (detail), 1560-80 with later movement. Gilt brass, brass, steel, blued steel, silver and blue enamel, 3 1/2 h x 9 3/4 inch diameter. Milwaukee Art Museum, Gift of Richard and Erna Flagg, M1991.84. Photo by John Nienhuis. One of my favorite clocks in the Milwaukee Art Museum’s Collection has a mythological theme. 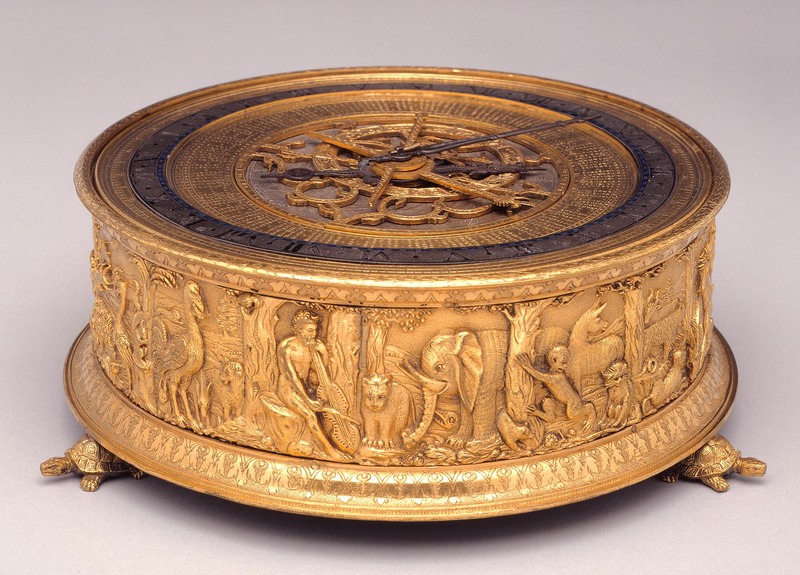 The Table Clock with Orpheus Frieze is a drum-shaped clock with its dial on the top. The side lends itself to decoration, and in this case the artist decided to depict Orpheus charming the animals. Orpheus sits and plays his lyre (a specific type of lyre played with a bow like a cello) while all of the beasts of the forest calmly sit and listen. The beasts include a wild cat, an elephant, monkeys, a donkey, large birds, and even a squirrel! The inspiration for the clock’s frieze comes directly from engravings by the artist Virgil Solis from Nuremberg, Germany. You can see one of these engravings below, which is in the collection of The British Museum. Print made by Virgil Solis (German, 1514 - 1562), Orpheus and the animals, 1540. Etching. © The Trustees of the British Museum. At first, it may seem strange, or random, to have a myth like this on a clock. During the Renaissance, however, Orpheus was often used as a metaphor for the triumph of art over nature, in that his artful music soothed the wild animals of the forest. This parallels the use of a scientific instrument (the clock) as a decorative object that illustrates the artistic prowess of a craftsman. Also, in another part of the Orpheus myth, the hero descends into Hades to bring his lovely Eurydice back to life only to lose her again when he turns to look at her. The story illustrates that time, and death, are not escapable. Combining both aspects of the Orpheus story, the myth may also suggest that the key to immortality is through art. What better myth to use on the side of a clock? A final note on the clocks in the Museum’s Collection: The Museum collection includes wonderful rarities because Milwaukeeans Richard and Erna Flagg collected them and donated them to the Museum. In fact, the Milwaukee Art Museum is known to have the best collection of German Renaissance clocks anywhere outside of Germany. This entry was posted in Art, Curatorial and tagged 16th Century Art, clocks, Collection, Decorative Arts, European art, From the Collection, German Art, metalwork, Virgil Solis. Bookmark the permalink.